Dublin has recently entered a project with Intel to place 200 sensors across the city to gather and monitor environmental data. IF YOU LOOK at the surface of Dublin city, it may seem like very little is happening, but some important projects are under way that will help improve our cities. Gathering data about the day-to-day life of cities like Dublin have been in the works for years, with the latest example being Dublin City Council and Intel placing 200 sensors across the city to gather and monitor environmental data such as air quality, and noise levels in the city, the aim of making the data available to residents and other parties. 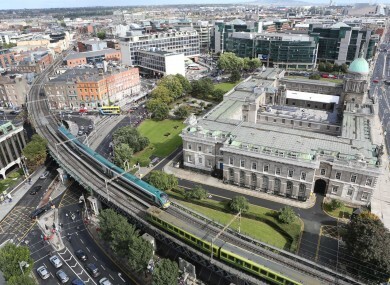 Professor Rob Kitchin, director of the National Institute of Regional and Spatial Analysis at NUI Maynooth, is currently involved in another five-year study featuring Dublin and Boston, looking at how software and technology can influence life in a city, meaning he has much experience in this field and the challenges that are presented as a result. The benefits aren’t just limited to Dublin itself, other cities are involved with their own projects, while collaborating and sharing ideas and findings with each other. One such example is test-bed urbanism, which sees one city volunteer to try out a new technology while other cities see what the data says and lessons learnt, and decide whether to adopt it directly, go for a different approach or do something entirely different. Naturally privacy and protection of data is another major aspect. While it difficult to foresee every potential outcome and drawback, one of the concerns is de-identification (the process of taking organised data and selectively adding specific sets of duplicate data) which can identify certain overlaps and undo the concept of anonymous data. Although that said, there are certain protocol in place for Dublin such as a threshold for which you can’t show data if an area has less than five people who have a certain characteristic since it would be possible to identify them if it was compared with other data. Email “These are the challenges faced in making our cities smarter”. Feedback on “These are the challenges faced in making our cities smarter”.